Happy Anniversary, Lilo and Stitch! 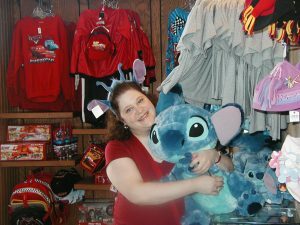 The very first time we met Stitch, October 2006! On this date in 2002, Lilo and Stich (Walt Disney Pictures) was released. 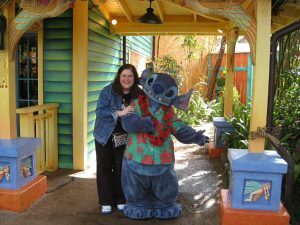 I have loved Stitch since I saw that film. 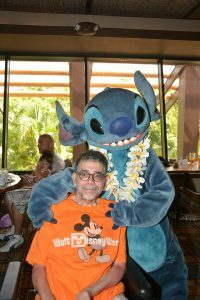 When Ben and I went to Walt Disney World and I had read that Stitch could be found at the Magic Kingdom, I was on a mission to find him. Ben was very patient! 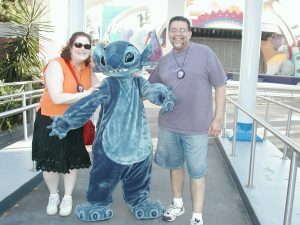 In honor of the film and my buddy Stitch, here are some photos from our visits to Walt Disney World over the years. Ben liked taking pictures of me with Stitch because he was my good buddy and Ben got a kick out of that. I look at those photos and even though Ben was the photographer, in my mind and in my memories, he is so present in those moments and I can vividly see him laughing. I am so grateful for these memories. Halloween with my buddy in 2010. Ben could still take photos at this point, which makes this picture especially sentimental. I think the funniest memory I have is from our 2012 trip. Walt Disney World has many and great accessible restrooms, which made life much easier for Ben. I would get Ben situated and wait outside because he couldn’t walk to lock the door. Also, I could hear him if he needed assistance. 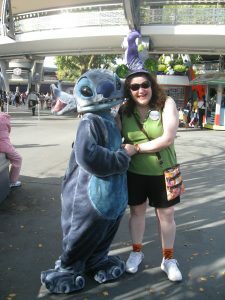 One day, while I was waiting for Ben, Stitch walked by and I yelled hello to him. OK, yelled a lot, with much waving. Moments later, Ben called to me. As I helped him into his scooter, he couldn’t stop laughing, imitating my calling Stitch and saying that he started wondering how he was going to get himself out of the bathroom because he knew Stitch was one of my favorite friends and he thought I might abandon him! I did not! And, I’m not telling if I thought about it! I hunted him down at the Animal Kingdom in 2007! 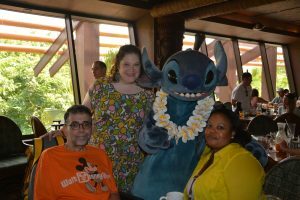 On our last visit in July 2014, Ben knew that one of the things I had always wanted to do was have breakfast at the Polynesian Hotel with Lilo and Stitch. I had not mentioned it because it was a long commute from our own hotel and I didn’t want to tire Ben. But, he wanted us to have that experience. I think Ben wanted to laugh at me gushing at Stitch, which, of course, I did! Stitch was his adorable self, as was Lilo. They were very attentive and considerate of Ben and his inability to get out of his seat. It was an incredible time that I will never forget, particularly wonderful because it was a brand new memory, as opposed to memories we were trying to recreate to almost try to turn back time to the days before ALS. I will never forget the magical connection that Ben and I felt when we were at Walt Disney World. Stitch gave Ben some extra love!